Well . . . my daughter's turning four (I can't believe it!) and has informed me that she would like a pink dinosaur party this year. A little unorthodox, I know . . . but she's the birthday girl. I'm finding that I'm going to have to pull this thing together mostly from scratch. There aren't a whole lot of pink dino's out there. Not a popular choice among the girls . . . but that's OK. I have to tell you that at first I was opposed to the whole dinosaur party theme but it's actually grown on me. I've discovered that dinosaurs can be fun . . . and cute. Yes cute. As I was hopelessly searching the internet for pink dinosaurs, I miraculously came across this. 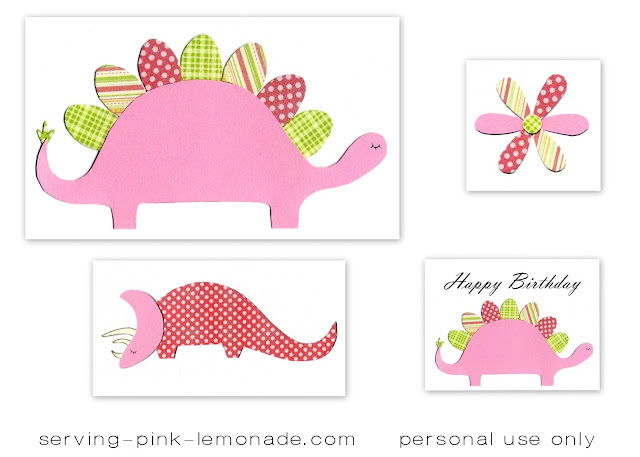 The cutest dinosaurs I've ever seen, and pink too! Thank you Holly! Cute for dinosaurs, right? I'm just thrilled with them. I used some coordinating scrapbook paper, cut out and pieced everything together. I then scanned them onto my computer and printed them out to create invitations and cupcake toppers. The font I used is called "Action Is" that I down loaded from 1001freefonts.com. Want to see the final product? Stay tuned for the rest of the birthday festivities to come . . .
How adorable! And you are super creative. I'm planning my daughter's three year party, what to do???? Dinos maybe? Actually, we're doing a nantucket big girl room, so we were going to have a party around that same theme and reveal her room to her at her party. NOw, I just need to get creative!! My daughter wants the same thing! She is also turning 4. Thanks for posting all this, it was a lifesaver! Oh these are lovely, can't wait to do some hand-made invites for my kids birthday!